Ever since the launch of the GeForce 8800 GTX in November 2006, it’s mostly been a one-sided affair at the high end of the graphics card market and every time there was a chance that AMD might compete with Nvidia, the company rolled out something faster still to thwart the efforts put forth by the troubled platform manufacturer. It’s fair to say that AMD was in trouble, and it needed a lifeline of sorts to get back in the game. That lifeline came in the form of the Radeon HD 4800 series which, with the Radeon HD 4870 and HD 4850, brought two aggressively priced cards to the market that not only delivered great performance, but also incredible value for money. They helped to upset Nvidia’s dominance in the market and although AMD didn’t win back the performance crown, it really didn’t need to – it had done enough to ruffle the feathers of Nvidia’s GeForce GTX 200 series. AMD hasn’t exactly been quiet about the product it is launching today – the ATI Radeon HD 4870 X2 has been talked about in various levels of detail since before Nvidia launched the GeForce GTX 200 series cards. And once AMD had seen how Nvidia’s new cards performed, the company’s marketing team felt it was time to really start talking the 4870 X2 up – it believed there was a serious chance it could regain the performance crown with its R700 graphics card. Initially, AMD just talked about its strategy, pointing out that it plans to no longer occupy the high-end market with a big, monolithic GPU. It instead designed a more modestly-sized GPU that could then be doubled up to scale up into the low-volume, high visibility market right at the top. The first attempt at this was with the Radeon HD 3870 X2 and although it worked to an extent, I still wasn’t 100 percent convinced that it was the right way forwards. First of all, RV670 wasn’t all that brilliant when it came to performance and pairing up a couple of them didn’t deliver enough of a boost to retake the crown. Not only did it still have a number of chinks in its armour inherited from its late but troubled parent, R600, but there were also some drawbacks in AMD’s ATI Catalyst drivers. Some games just didn’t scale at all well and that was bad news because in situations where there was no scaling, you ended up with a card that was slower than Nvidia’s modestly-priced and incredibly popular GeForce 8800 GT, despite costing nearly twice as much. With the ATI Radeon HD 4870 X2, the basic design principles are the same as those used for the 3870 X2 and in fact, as you’ll see shortly, the two look remarkably similar. There’s still a pair of GPUs, each with their own independent local memory pools and they’re connected together via a 48-lane PLX bridge chip that also acts as the card’s interface to the rest of the world. On paper, it’s the fastest GPU in the world by quite some margin – it’s exactly twice as powerful as the Radeon HD 4870, so the 4870 X2’s performance should be relatively similar to a pair of 4870s in CrossFire. 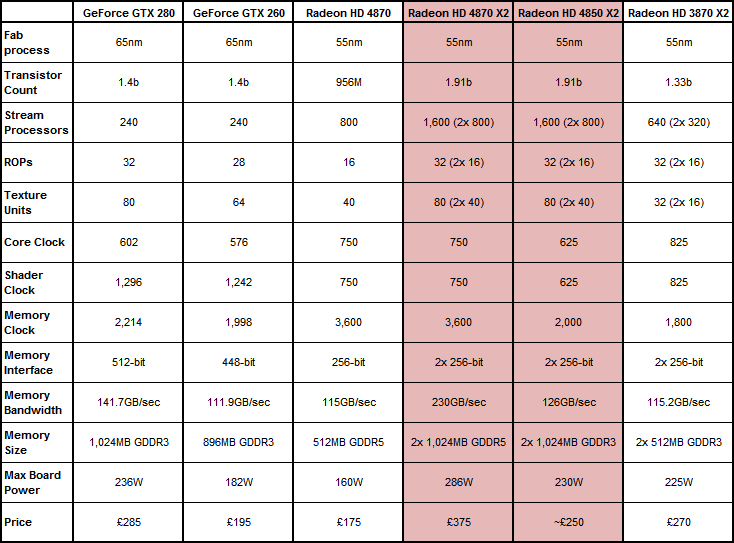 But there’s more to it than that and some of the changes have the potential to make the 4870 X2 even faster.